A new release we are really proud of – materials and low land impact. YAY! Our brand new Mesh Cedar Greenhouse is a 100% original handmade mesh creation made in our shop. The textures comprise of 3 layers to provide a superior look and to take advantage of Materials in current Linden Lab and TPV viewers. And the best part – the entire greenhouse is only 9 LI with a foot print of 10 x 10 meters. Other features include opening/closing doors, with optional security and greeting message. To enable these optional features, first make sure you have a backup copy of the greenhouse. Then rez it, edit linked parts and select one of the doors. In the content tab is a notecard called ‘door setup’. Follow the instructions in the notecard to set up group or individual keyhold access, as well as a custom greeting message. Repeat the process for the other door. We do not recommend you unlink the doors. Now available for purchase on the Second Life Marketplace, -Hanaya- in-world store or PrimBay. And coming soon, a texture change version with 2 options for each of the 4 seasons. Fitted greenhouse shelving will also be available in the next week or so. For a sneak peek, take a look inside the demo greenhouse that is on display at -Hanaya- in-world. 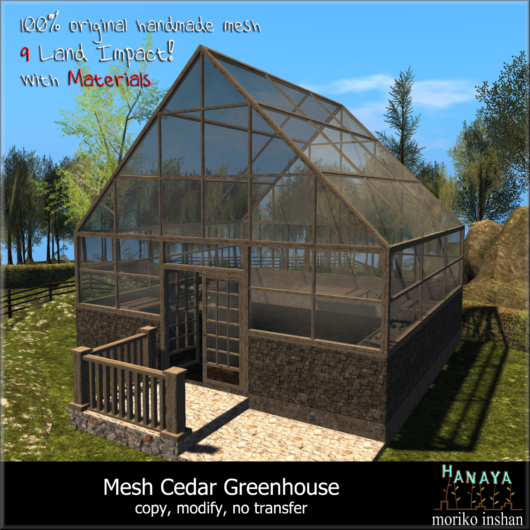 During the month February, March and April 2014, the greenhouse is on display at -Hanaya- in-world store. Eligible for our VIP group members discount, and purchaseable as gift or via -Hanaya- Gift Card. This entry was posted in News, Product Announcements on February 20, 2014 by moriko. This coming Friday will bring the start of the World Tour 2014 Gridwide Hunt. Organized by Spooky Mistwallow and her able team, this year’s hunt concept from Kastle Rock Hunts is a really fun one. Imagine visiting 7 continents and scooping up awesome themed hunt gifts along the way. Using a custom-made hunt HUD, hunters will be able to start at a continent of their choice and keep track of which ones they have visited. Since -Hanaya- is a Japanese flower shop, you will find us on the Asian continent. 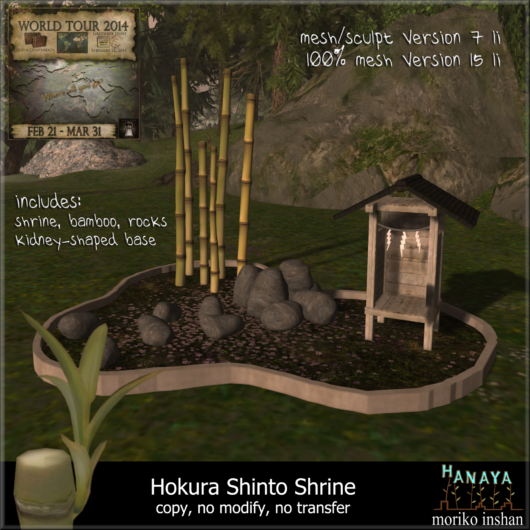 Our hunt gift is a 100% original mesh shrine set on a kidney shaped grassy base, shaded by a cluster of bamboo and rocks. Two versions to offer a reduced Land Impact are offered as part of the gift. The World Tour 2014 Gridwide hunt takes place February 14 – March 31, 2014. So come and visit -Hanaya-, wander in our garden and forest, and hunt for the Hokura Shinto Shrine. Safe travels! This entry was posted in Freebies and Gifts and tagged hunts, shrine, World Tour 2014 on February 17, 2014 by moriko. Just in time for Valentine’s Day 2014, we are happy to present our newest flower bouquet – red and pink wearable mesh roses. Both of the mesh bouquets include a wearable version with pose (as in the image below), as well as a display version. Permissions are no copy/modify/transfer, so you can hand deliver them in-world. Both bouquets also include a cute mesh gift bag with card, which is also tranfer/modify. So if you wish, you can add other goodies inside the bag, and rename it before giving to your special person in-world. 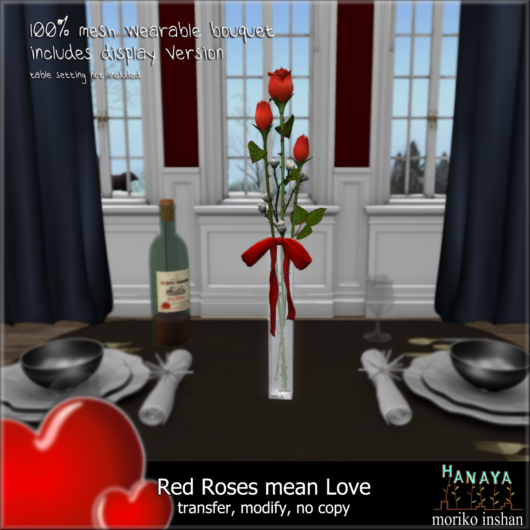 -Hanaya- Red Roses mean Love, and Pink Roses mean Happiness are now available for purchase at our in-world store, as well as the Second Life Marketplace and PrimBay. In-world purchases are eligible for our VIP group discount – just make sure you wear your group before buying. This entry was posted in Product Announcements on February 7, 2014 by moriko.